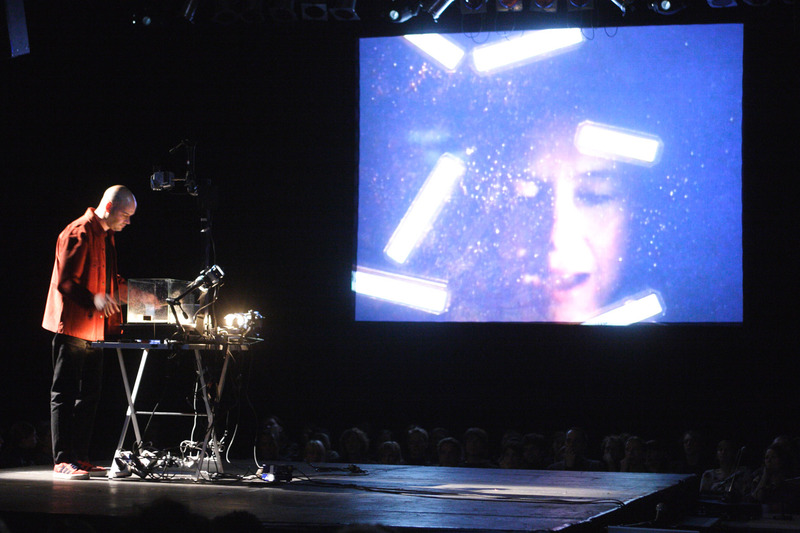 A live sound and video performance that includes the poem tour de trance written by the German poet Monika Rinck. An ever-changing visual landscape created inside a glass aquarium allows the random recombination of drifting words of Rinck´s poem. 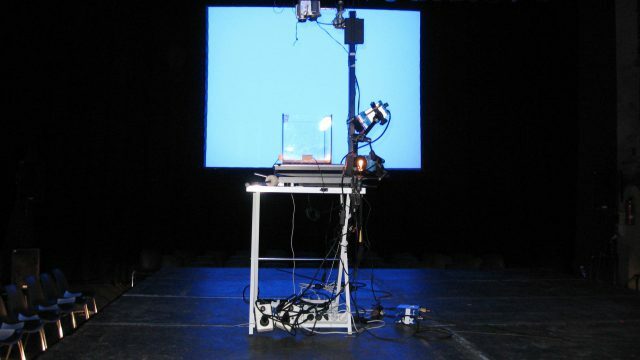 The piece aims to explore new ways of interaction between music, images and text. A glass aquarium is placed on a table on the stage. The aquarium is filled with water, flourescent color pigments and is illuminated with small spotlights. Floating on the water are cut ups of words and phrases taken from the poem tour de trance. Right above the aquarium there is a video camera set in record mode that picks up images from inside the aquarium and project them onto a big screen or screens. Under the aquarium there is a monitor showing a pre-recorded video of the poet´s face that fades in and out at different points during the performance. Contact microphones are attached to the external walls of the aquarium. Sounds are produced by means of percussion made on the outside and inside walls of the aquarium. Drumsticks with different heads (soft, hard, brush, etc) are used to produce different sounds that are routed into a computer. The computer is used for the live controlling, processing and triggering of sound and video materials. The percussion performed outside and inside the aquarium makes the floating words and phrases to drift randomly on the water producing ever changing combinations of the original poem. 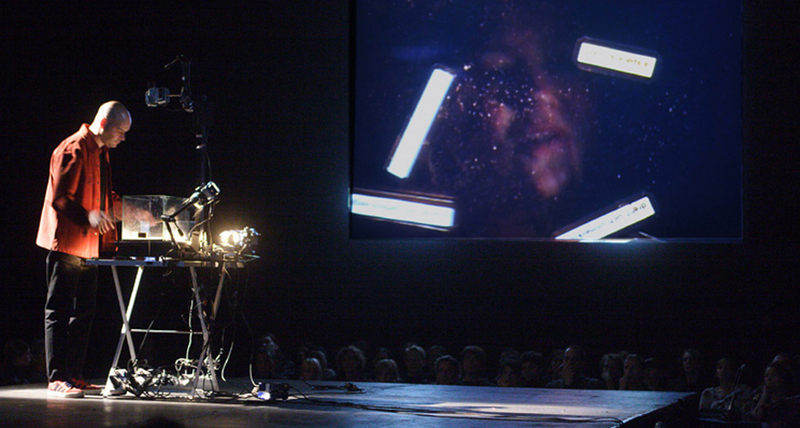 The monitor placed under the aquarium shows a pre-recorded video of the poet´s face that is triggered live at specific points during the performance. The public sees on the big screen words and phrases drifting on the water and at some points the poet´s face fading in and out as if coming from the depths of the water. A real-time ever changing visual landscape composed of different textures, shades and colors is generated with the words drifting on the water, water movement, the flourescent color pigments and the spotlights. my task, she said, was poisoning time. wie sich alles drehte, wiederholte, dehnte, und rotierte, die wärme war a space so vast, so katastrophisch groß, war sie arena worin die trümmer von objekten trieben, wilde schläge in der ferne, keiner hörte, jeder fühlte, die wellen der erschütterung. wo etwas fehlte, wurde alles größer, drehte sich, rotierte, kam in´s schlingern und blieb dann in der mitte liegen. die müdigkeit war eine kur, das gewicht der atmosphäre, halluzinogene leere federte, es drehte sich jetzt weniger als wãren die schläge, in dem was sie sind gegenstand der verdünnung, als würde die zeit, der reißende raum, präzise und zärtlich vergiftet, in ihrem gewebe stiege die chemische schwäche, es schãumte, erstickte, das weiße lager der krusten, das sich formierte, wird reicher und toxisch verrauschten die schläge, es dreht sich, dreht sich unmerklich, und steht. how it all turned, repeated, extended and rotated, the warmth was a space so vast, so catastrophically great, it was an arena in which the debris of objects drove forth, wild blows into the distance, none heard, every one felt, those waves of concussion where something was lacking, it all became larger, turned, rotated, came into that lurching and then remained still in the center. weariness was a cure, the weight of the atmosphere, hallucinogenic emptiness recoiled, now turning less as if the blows were, as they are, matter of rarefaction, as if time, this wrenching space, was precisely and delightfully poisoned, in its texture the chemical frailty, it seethed, choked, the white bed of crusts forming there becomes richer, toxically the blows subside, it turns, turns imperceptibly, and stops. comme tout tournait, se répétait, s´étirait, et pivotait, la chaleur était a space so vast, so catastrophiquement grand, elle était une aréne dans laquelle les débris d´objets dérivaient, des coups sauvages dans le lointain, pas un n´entendait, chacun sentait les secousses du choc. là où quelque chose manquait, tout devenait plus grand, tournait, pivotait, se mettait à déraper et s´arrêtait ensuite au centre. la fatigue était une cure, le poids de l´atmosphére, un vide hallucinogène faisait ressort, ça tournait moins maintenant comme si les coups étaient, dans ce qu´ils sont, matière à dilution, comme si le temps, cet espace impétueux, ètait minutieusement et tendrement empoisonné, dans sa texture montait la fragilité chimique, ça écumait, étouffait, la couche de croûtes blanche qui se formait devient plus riche et toxiquement les coups diminuaient, ça tourne, ça tourne imperceptiblement, et s´arrête.